Right at the heart of Portugal lies the Beira region, which is divided into three sections, the Beira Litoral (the coastal section, home to the Bairrada wine region), the Beira Alta (the upper mountainous region, which is where Dão wine comes from) and the Beira Baixa (the lower region). This part of the country is home to some of Portugal’s most distinctive and distinguished red wines, and rapidly improving whites. What do you look for in a red wine? Do you favour elegance over power and concentration? Do you prefer a wine that is balanced and food friendly over one that’s soft and sweetly fruited? If so, the red wines of Dão could be just what you are looking for. The key to understanding these wines lies in the geography of the region. Dão is surrounded by mountains, and the vineyards themselves are at altitudes ranging from 200–900 m. This means that the region is protected to a degree from the vagaries of the Atlantic weather system to the west, but not fully exposed to the harsh continental climate to the east. As a result, rainfall is high, but most of this falls in the winter months, leaving mostly hot, dry weather for the majority of the grape growing season. The altitude also helps temper the heat and allows the grapes to retain their all-important natural acidity. 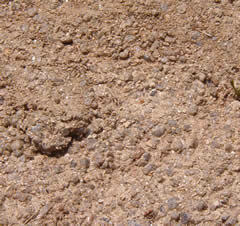 In addition, the soils here are primarily granitic in origin (illustrated left), with a high proportion of sand or in some cases some clay. It’s a soil that also tends to produce grapes with high acidity. 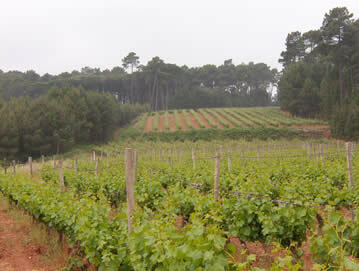 So this climate, coupled with the granitic soils, creates terrain perfect for making fine, elegant wines with good acid. And, as with so much of Portugal, the relatively untapped potential is now beginning to be realized on a large scale. In the past, progress in the Dão has been hampered by restrictive wine laws that insisted that almost all the grapes were processed by the big co-operatives. While there’s no reason that co-ops can’t make good wine, they have tended to take away any incentive for growers to excel in the vineyard by paying them according to quantity of grapes produced, not their quality. Over the last decade these restrictions have been removed and the average quality of Dão wine has improved tremendously: it is a region with a potentially exciting future. Investment by some of the country’s leading wine producers has flowed into the region, and there’s been a gradual shift away from the multitude of tiny smallholdings towards properly designed and planted vineyards. In addition, a number of small privately owned estates have pushed back the boundaries of quality. 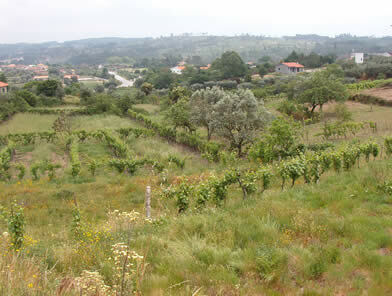 If you get a chance to visit Dão, you'll probably have to look hard to find the vineyards. For an important wine region like this it comes as a bit of a surprise that vineyards don’t dominate the landscape. 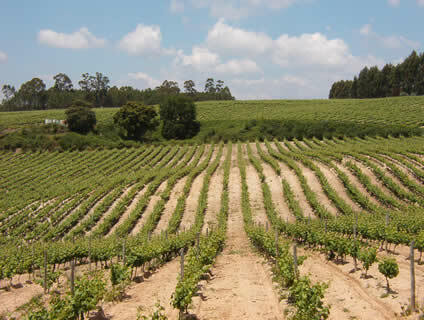 Just 5% of the region is under vine, with pockets of vines planted in clearings in the pine and eucalyptus forests clothing the hilly terrain. It is still a common sight to see smallholdings with vines planted around the perimeter of small vegetable patches (illustrated right). Large co-ops from the region have traditionally dealt with literally hundreds of growers, some with just a few bucketfulls of grapes - not ideal for quality viticulture. Dão is sometimes likened to Portugal’s Burgundy. It’s not because of any physical similarity between the regions, but because of the style of wine. Like red Burgundy, good Dão doesn’t rely on power for its effect, but instead aims at subtlety and finesse, a cause helped by the good natural acidity of the grapes. These wines range from light, peppery and spicy to more full bodied and fruity, but there is almost always a lovely suppleness and brightness to the fruit. While rather rustic examples still exist, modern fruitier wines are becoming more common. But even these modern versions still retain their essentially Portuguese character, which is surely a good thing in a world of increased standardization and uniformity. One of the keys to this individuality is the mix of grapes employed: you won’t find international superstar grape varieties like Cabernet Sauvignon and Merlot here. One of the unique selling points of most Portuguese wines is their reliance on indigenous varieties, and the Dão is no exception. Touriga Nacional is the leading red variety of the Dão. On its own makes strikingly spicy, peppery wines with lovely forest fruit character, but it is more commonly blended with varieties such as Tinta Roriz (the Tempranillo of Spain), Jaen and Alfrocheiro Preto. Many Portuguese winemakers are experimenting with making wines from just a single variety, but the general consensus is that blends work best. Dão also makes increasingly successful white wines, the best displaying good concentration of fruit with refreshing acidity and often some subtle nutty oak notes. 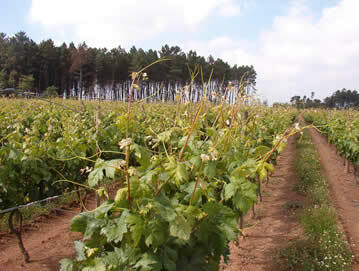 Encruzado is the leading white grape, often supported by Bical or Arinto, among others. But it's the reds that are the real focus here. On my recent visit (May 2004) I checked out the leading producers, and I'll be writing up my impressions over the next few weeks (the following is the list of articles to come).